Ecosystems that have been altered by human activities can provide suitable habitat for native birds, according to scientists in the United States and Australia. In a study published in the journal Ecosphere, the researchers concluded that while some native birds are sensitive to novel ecosystems, others don't seem to mind. The study results shouldn't be interpreted that habitat restoration to historic conditions is futile and that all novel ecosystems are acceptable, said lead author Pat Kennedy, a wildlife biologist at Oregon State University. But they do show that habitat restoration can be prioritized. "Prior to our study, the usefulness of novel ecosystems for native wildlife was a concept. Now we have empirical support," said Kennedy, a professor in OSU's College of Agricultural Sciences. "Our data suggest that controlling non-native plants may not yield important benefits for some nesting birds, yet we are spending a lot of time and money attempting to restore these ecosystems. We need to start thinking more critically about restoration priorities." For the study, the researchers compared the populations and behaviors of birds in Zumwalt Prairie in northeastern Oregon with birds in human-designed public gardens in Perth, Australia. On the Zumwalt Prairie, native grassland plants still dominate the ecosystem but non-native plants are present and available for use as breeding sites. After the prairie was opened to homesteading by white settlers in the 1860s, livestock herds were confined by fences and cultivation was practiced in localized areas. 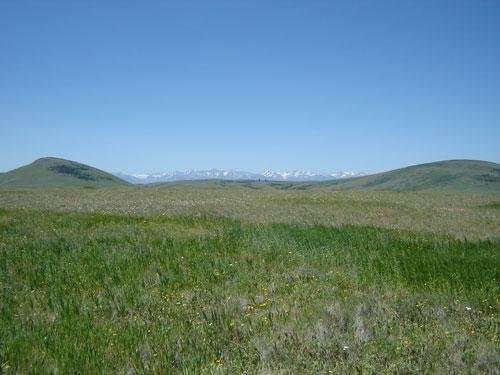 Early homesteaders often planted these rangelands with non‐native grasses to enhance forage production. Due to the dry and cold climate, homesteads were eventually abandoned and cultivation ceased except on the extreme southern areas of the prairie that are wetter and less rocky. Unlike many prairies in the United States, very little of the Zumwalt Prairie has been cultivated. Studying ground-nesting birds, Kennedy determined the majority of the species nesting in the prairie were successful nesters in native and non-native vegetation. She categorized them as novel ecosystem utilizers. The savannah sparrow seemed to be affected by the presence of non-native plants and was considered a novel ecosystem avoider. "There are a lot of ecosystems, like the Zumwalt Prairie, that no matter what we do, they are not restorable to what they were 250 years ago," Kennedy said. "Although often described erroneously as 'degraded,' some of these non-restorable sites can provide suitable habitat for novel ecosystem utilizers. The non-native plants likely provide resources for these birds or do not get in their way." In Perth, researchers at Murdoch University found only one group of species – nectarivores, which comprise birds like honeyeaters and wattlebirds – that were sensitive to the presence of non-native plants in urban gardens. The majority of the native garden birds were novel ecosystem utilizers. "While our gardens don't work for every bird species that used to roam the Perth metro area before European settlement, our study has highlighted they can play an important role in supporting urban biodiversity," said Joe Fontaine, a wildlife scientist at Murdoch University.